© SPIE - The International Society of Optical Engineers. The x-ray radiographic testing method is often used for detecting defects as a non-destructive testing method (NDT). In many cases, NDT is used for aircraft components, welds, etc. Hence, the backgrounds are always more complex than a piece of steel. Radiographic images are low contrast, dark and high noise image. It is difficult to detect defects directly. So, image enhancement is a significant part of automated radiography inspection system. Histogram equalization and median filter are the most frequently used techniques to enhance the radiographic images. In this paper, the adaptive histogram equalization and contrast limited histogram equalization are compared with histogram equalization. The adaptive wavelet thresholding is compared with median filter. Through comparative analysis, the contrast limited histogram equalization and adaptive wavelet thresholding can enhance perception of defects better. Nondestructive testing (NDT) is widely used in many fields, particularly for critical applications such as welds of pressure vessels, ships, aircraft etc. One of the most important techniques used in NDT is radiography that is based on the transmission of X-rays or Gamma rays through an object to produce an image on radiographic film. The interpretation of a radiograph is being done manually by experienced interpreters in the field. It is time and manpower consuming work. 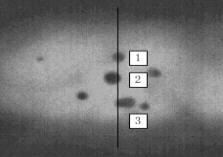 In addition, human interpretation of weld quality based on film radiography is very subjective, inconsistent and sometime biased. The computer technology has developed very quickly in terms of both hardware and software. So, it is possible to use computer vision to detect the defects instead of a human being. Image enhancement is a significant part for automated radiograph inspection systems. From the Fig. 1, Fig. 2 we can see that the image is low contrast, high noise and the background is not uniform. The defects are all quite small and their positions are random. These factors make defect detection difficult. So, it is necessary to enhance the contrast and reduce the noise before defect recognition. Currently, most researchers use histogram equalization to enhance contrast of radiographic images and use median filter to reduce the noise of radiographic images , , . In this paper we propose to use contrast limited adaptive histogram equalization and adaptive wavelet threshoding to enhance radiographic images and compare them with histogram equalization and median filter. Radiographic images usually have poor contrast. The aim of contrast enhancement is to improve the quality of radiographic images. In the original radiographic images, the distribution of gray levels is highly skewed towards the darker side as show in Fig. 4. Therefore, it is desirable to stretch the histogram distribution to a rectangular shape instead of a skewed one. Currently, the most frequently used technique to enhance the contrast of radiographic images is histogram equalization (HE). It is based on the assumption that a good gray-level assignment scheme should have equally distributed brightness levels over the whole brightness scale. Individual pixels retain their brightness order. However, the values are shifted so that they are equally distributed over the brightness scale. The result of the brightness transformation should be that the cumulative histogram becomes a straight line. where DG' = G'max - G'min, G'max and G'min represent the upper and lower limits of the transformed gray values respectively, H() represents the cumulative histogram of the gray values of the original images, and N represents the number of pixels over which the histogram is taken. HE transforms image pixels based on overall image statistics. Adaptive histogram equalization (AHE) involves selecting a local neighborhood centered around each pixel, calculating and equalizing the histogram of the neighborhood, and then mapping the centered pixel based on the new equalized local histogram. . For example, at each point in an input image we could consider a 8 x 8 window around that point. The 64-element histogram could then be used to determine a mapping function to histogram equalize that point based on the neighborhood. Since each point would be based on its own neighborhood, the mapping function can vary over the image. Contrast limited adaptive histogram equalization (CLAHE) seeks to reduce the noise produced in homogeneous areas by basic adaptive histogram equalization, and was originally developed for medical imaging, has been successful for the enhancement of portal images . The homogeneous areas can be characterized by a high peak in the histogram associated with the contextual regions since many pixels fall inside the same gray range. With AHE, a local histogram is calculated and used to obtain the final value. High peaks in the histogram lead to large values in the final image because of integration. This problem can be corrected by limiting the amount of contrast enhancement at every pixel, which is achieved by clipping the original histogram to a limit. We enhanced the radiographic images by HE, AHE and CLAHE. The result of histogram equalization on a typical radiography image can be seen in Fig.5. As a digital radiographic image has only a finite number of gray scales, an ideal equalization is not possible. It causes some pixels with initially different brightness values to be assigned the same value, and other values to be missing altogether. Form Fig.5 and Fig.6, we can see that the histogram equalization enhances the contrast for brightness values close to maxima in the histogram and decreases contrast near the minima. That is, it improves the contrast in the image in areas of poor contrast at the expense of those areas where there is already good contrast. Fig.5 shows that histogram equalization in its basic form can give a result that is even worse than the original image. Large peaks in the histogram can also be caused by large areas of similar brightness. Frequently these correspond to areas of background, and are essentially uninteresting. The effect of histogram equalization on these areas is to enhance the visibility of noise. The feature of interest in the radiographic images such as defects need enhancement locally. However, the technique does not also adapt to local contrast requirements; minor contrast differences can be entirely missed when the number of pixels falling in a particular gray range is small. Figures 7 shows adaptive histogram equalization with window size a 8 x 8. The local contrast is largely improved. And the minor contrast differences of defects with background can be kept. However, the most striking feature of the image is the background noise that has become visible. So, noise present in AHE images is a major drawback of this method. Applying contrast limited adaptive histogram equalization on the image in Fig. 3 results in image that can be found in Fig. 9. The defect contrast is improved. At the same time, the background noise is greatly reduced. In fact, CLAHE is an improved version of AHE. It can overcome the limitations of standard histogram equalization and AHE. Median filter is a most frequently used technology to remove the noise from the radiographic image. The median filter deploys a small mask template, which is usually 3 x 3 or 5 x 5 . The template operation maybe calculated by either correlation or convolution operators. The median filter replaces a pixel's gray level with the median value of its neighborhood. where N(x,y) is the immediate neighbors of the pixel (x,y). Wavelet thresholding (first proposed by Donoho ) is a signal estimation technique that exploits the capabilities of wavelet transform for signal denoising and has recently received extensive research attentions recently. Wavelet denoising attempts to remove the noise present in the signal while preserving the signal characteristics, regardless of its frequency content. It involves three steps: 1. Calculate the wavelet transform. 2. Threshold the wavelet coefficients and discard (setting to zero) the coefficients with relatively small or insignificant magnitudes. By discarding small coefficients one actually discards wavelet basis functions that have coefficients below a certain threshold. 3. Compute the inverse wavelet transform to get the denoised estimate. where s is the noise standard deviation, sx is the signal standard deviation. We reduced the radiographic images using median filter and adaptive wavelet thresholding as shown in Fig. 11. Gray level changing is the main feature of the defects, the method that can remove the noise as well as affect the sharpness of the edges least is better for defect recognition. From Fig. 11, we can see BayesShrink is more visually appealing and adapts to discontinuities in images than median filter. In order to compare these two methods more carefully, the gray level of the pixels along the line (refer to Fig.11) is shown in Fig.12. The gradient (first order derivative) of the gray level along the line (refer to Fig.11) is shown in Fig.13. For adaptive wavelet thresholding, the change rate of the gray level and the gradient is higher. Table 1 shows these in detail. Therefore, adaptive wavelet thresholding can keep the sharpness of the defect's edge well. In this paper, we proposed using contrast limited adaptive histogram equalization and adaptive wavelet thresholding to enhance radiographic images. The comparative analysis between the proposed methods and currently frequently used methods has showed the effectiveness of these methods. They showed promising results on radiographic images. CLAHE not only improved the local contrast of the radiographic images but also reduced the noise produced in homogeneous areas. The adaptive wavelet thresholding technique can remove the image noise while keep the sharpness of defects' edges well. Therefore, CLAHE and adaptive wavelet thresholding can greatly enhance radiographic image and they will be helpful for defect recognition. Rosenman, J., Roe, C. A., Cromartie, R., Muller, K. E. & Pizer, S. M. Portal film enhancement: Technique and clinical utility. Int. J. Radiat. Oncol. Biol. Phys. 25, 333-338, 1993. D. L. Donoho, De-noising by Soft-Threshholding, IEE Transactions on Information Theory, Vol. 41, No. 3, May 1995. S. Grace Chang, Bin Yu and Martin Vetterli, Adaptive Wavelet Thresholding for Image Denoising and Compression," IEEE Transactions on Image Processing, Vol.9, No. 9, pp. 1532-1546, Sep. 2000.